Poker companies know for a fact that the numbers act as a magnet for players and whenever they have the opportunity, they host a major events. 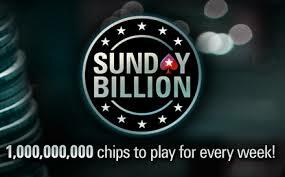 Aggressive advertising also helps, but this time PokerStars took a different approach with its latest release which goes by the name of Sunday Billion. This is obviously a tournament that will take place on Sunday, but the name can be a bit deceiving because it has very few similarities with the Sunday Million. Definitely the most important difference is the fact that the flagship event at PokerStars is played for real money, whereas Sunday Billion is basically a play money tournaments. Competing on virtual currency has never been too exciting for poker professionals, regulars and grinders, but the organizers claim that this tournament will be different. Even though players will be competing for play money, it should be pretty difficult to amass 1 million chips to participate. Players can either buy in for one of the qualifiers for purchase chips with real cash, so they will think twice before going all in every single hand. PokerStars has announced that the Sunday Billion will be an event attended by poker professionals, which means that there is a good chance to sit at the same tables with these prominent pros. Being the first to win the event is also a strong incentive for those who are still in doubt, but the real question is whether the tournament will be successful on the long run. Those who came up with the concept are fairly confident and expect players to take the Sunday Billion Event seriously. There is always the risk of playing against people who go all in because they couldn’t care less about play money, yet the chances are mitigated by the high buy-in. Those who strongly believe that there is more to poker that winning money, will surely be thrilled with this new event and it is only fair to expect thousands to sit down at the tables each Sunday.